Hi I’m Camille, I’m vegan and I fell in love with a meat eater. When I first went vegan, my dream was to marry a vegan guy and have vegan babies. Then I met the love of my life and he didn’t share my same passion for a plant based diet. Sure it wasn’t that hard when we first started dating, especially because we were long distance. We would just pick restaurants that we could both eat at. As time went on, it became increasingly difficult to eat out together as I soon grew sick of eating $15 salads. Today, I am sharing five ways to help the both of you find some common ground. This list of five ways to help ease the dietary boundaries isn’t just for significant others, it can be for friends and family too! *For all intensive purposes I am using “he” in relation to my boyfriend. Substitute whoever is the meat eater in your life! Realize that he may not go vegan. The worst thing you can do is try pushing something to do something they don’t want to do. Think about how you would react if they wanted you to eat meat. The more you push them to become vegan, the more they may not want to. Instead, try sharing why you eat this way and let him ask questions. At first, I tried pushing my boyfriend Zach into becoming a vegan. Didn’t get me anywhere and just led to disagreements. He grew up in a place where being a vegan was weird and unusual. It wasn’t as unusual where I grew up. Over time I accepted his dietary habits and he accepted mine. One way that we are able compromise on his eating habits was buying organic and local meats/dairy products. He still gets those products while I feel a tad bit better about buying them. I now live with my boyfriend, so coming up with meals for the both of us can be tricky. I am typically the one who cooks and I’m not too keen on whipping up a huge steak for him. However, one thing that works for the both of us is that I’ll cook the base of the meal. I’ll make a vegetable stir fry and if he would like some chicken in it, then he is welcome to come cook the chicken. Often times, he just eats it without meat! This happens all the time with our dinners. It helps me too, so I am able to cook just one meal and not spend too much time in the kitchen. It’s no fun sitting at a restaurant and realizing you cannot eat a single thing there. Same goes for your significant other. Zach doesn’t exactly want to eat a coconut “bacon” sandwich. Look at menus of restaurants before you even leave your house. Make sure you are able to eat there before you sit down. Our favorite restaurant has both vegan and meat options, so we typically go there if we are eating out. Another thing I do is just google “vegan at ____”. You can oftentimes find articles about vegan options everywhere. I was even able to eat at Denny’s- I wouldn’t have guessed I could eat there if I hadn’t googled it. Look at the sides as well. Sometimes I’ll end up getting 3-4 sides and making a dinner out of it. Such as rice with different vegetables. Being in a relationship can be hard enough at times, and food isn’t something anyone wants to argue about. Respecting one another’s eating habits is a way to reduce those arguments. Just because Zach brings home a huge steak, doesn’t mean I will love him any less or will throw the steak out. Our relationship is much more important than the type of food that we eat. Focus on the bigger picture. This is a great area to set some rules on what you are willing to do. He knows not to use the same utensil when cooking our pasta and his meat so I am able to still eat the pasta. I’m willing to cook him eggs in the morning as well. This will be different for every couple. You may not be fine cooking any kind of non-plant based food or you may be fine doing so. Perhaps you want different pots and pans too. Talk to one another and see what you can do to help each other. While Zach may never go vegan, he is eating a more healthy diet. Expanding someone’s knowledge on healthy behaviors can only lead to a positive outcome. Watch some health conscious documentaries together-you may learn something new too! I think this tip is the best way to encourage anyone to eat better. When they have all the facts, they are able to make a conscious decision on how they should eat. If you say “you have to go vegan,” you aren’t making any kind of educated argument. 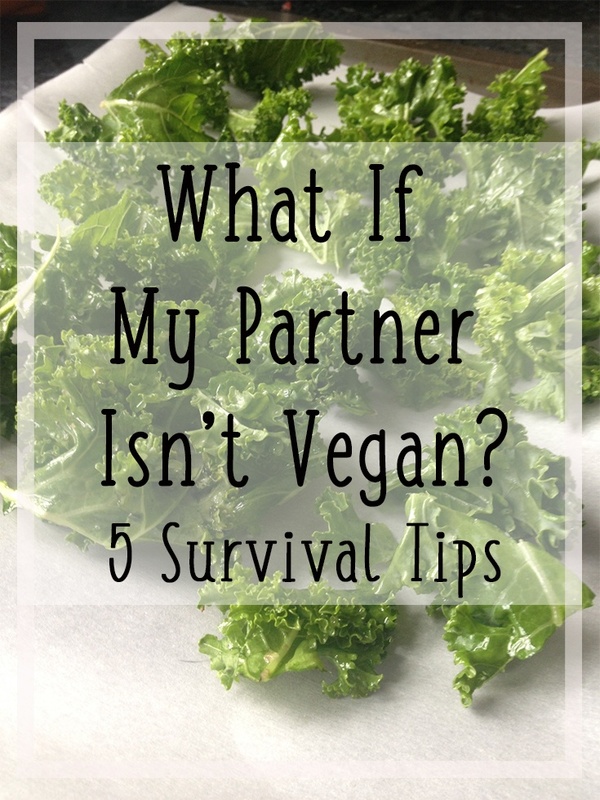 I hope these five survival tips help! Remember that you fell in love with the person as a whole, not their eating habits!